• L. is four weeks old today. When did that happen? • Weird moment today when Diggity and I realized that it was just the four of us alone in the house. We haven't been alone in our house since the end of December. We've loved having the help and the company - we really wouldn't have made it through the last month without it - but it was kind of cool having our little kids here at the house today. • Does anyone else who has a daughter feel like they are dressing a baby doll? 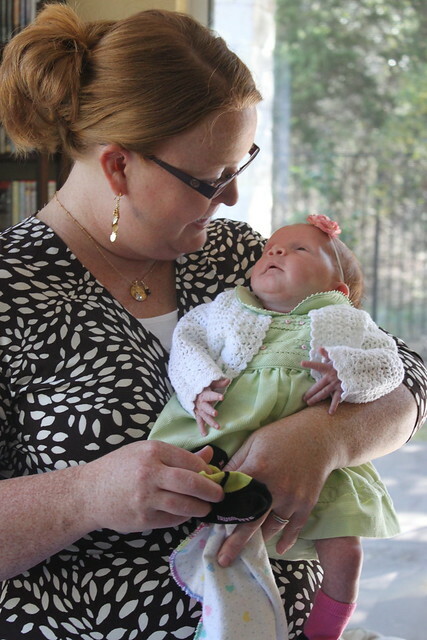 My mother-in-law took this photo yesterday after I finished dressing L. for church. I got such a kick out of getting her dressed yesterday. • G-Man was so excited to introduce L. to his teachers when I picked him up at school today. I love that he loves her so much. It's so wonderful. • We're leaving our beloved warm weather this week and heading to Utah for my first performance with Time Out for Women. I'm nervous, but so excited to start this new adventure!